Is cloud still thought of as “separate” from your other operations and projects? Allwyn Sequeira of The Data Center Journal advises that we must break free from that mind-set and instead think of public cloud as a system that works with your data center and supplements what you are running on-premise today. Essentially, cloud is a key piece of a hybrid operation that can help improve performance, agility and scalability. 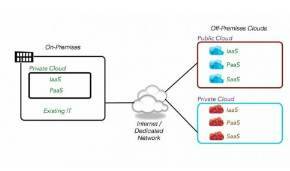 Mr. Sequeira provides several scenarios where cloud adoption should be considered. Equipment upgrades and refreshes. Do you have local equipment close to reaching capacity or a new project that requires your system to scale? It may seem automatic to request a price for new hardware to meet the new demand, but actually, this is a great time to explore what cloud options are available and how they would work with your data center. Cloud can be provisioned faster than new physical hardware, and long term cloud will allow you to scale and adapt to future needs quicker. Mergers and acquisitions. When a company merges with another or acquires new businesses, this is a great time to think through cloud adoption. The cloud can be a cost-effective solution for integrating new systems and it can reduce transition time versus building or installing new hardware. Pilot projects and testing. Many companies adopt cloud solutions for development and testing of new projects. The cloud removes the need to provision specific hardware to the project reducing time and cost. Look at cloud as another tool in your IT toolbox. It should be considered like any other tool when you are creating solutions to meet business and market needs. Integrating cloud into your organization is more of a journey than a one-time project. As your business needs evolve so can your cloud needs. Is hybrid cloud adoption your next stop? By adopting hybrid cloud companies can tap into the flexibility of public cloud services while also utilizing private cloud for more sensitive data and applications. Today let’s look at seven steps your organization can take to integrate hybrid cloud from John Meegan of IBM’s Thoughts on Cloud. Your company’s unique operation and needs should drive what cloud model to choose. On connectivity, he points out that IT should remember that aside from connecting components, you must also consider does the connection meet service levels, security and does it empower your overall IT management strategy. Mr. Meegan also mentions your organization should consider using network virtualization if available and make sure connectivity also supports resilience and disaster recovery requirements. Finally, think through how you will manage your hybrid cloud environment. What tools do you have in place? What tools does your cloud provider have? How can these be utilized in your operations? Working in multiple environments creates additional challenges but the right management strategies and tools can help your team manage your IT operations in and out of the cloud. Today let’s take a look at recommendations on how to ensure successful cloud adoption. Knowing your current IT systems in and out will help you make the right choices to better ensure successful cloud adoption. Since I have been working with, in or around the cloud for a good portion of my career, first as a Data Center manager in placement decisions be it into the cloud or purposefully in colo sites, or in data centers I managed, to my work as a cloud architect, the one thing I am always asked about is use cases. The question is usually either asked as a way to defend keeping all things in an owned data center, or by folks who have only heard of cloud in passing and can’t quite grasp what it really is. My answer is usually around what the business goals are and what current problem areas exist. This is because I don’t think cloud, just like all of the rest of IT, is a one size fits all. Basically, it is a tool in the tool belt of IT, just like various SAN, NAS, Server and Software options are. Not everyone fits running SAP, just like not everyone needs a Tier 1 storage array. The goals of the company and skill sets are what make the use cases for or against cloud or anything in IT. With all of that said/typed in the above paragraph, I would like to take some time to define the most common cloud use cases that I see being adopted by the various customers I am working with. Most people I have asked seem to think development or “bursting” type use cases are what cloud is for, however I rarely see these as the use cases that really lead people into taking advantage of the cloud and saving money doing so. The use case/s I usually see the most that benefit in terms of flexibility, definable scope and return on investment are Backup, Archive, Disaster Recovery and to a lesser but growing extent Data Analytics. These may not seem like the ones that many people hear about when they see cloud marketing, or attend a cloud seminar, but they are indeed some of the most cost effective use cases for the power of the cloud. MOL = Acceptable performance level of the DR location compared to production. I know this example is very small when compared to large environments, but I have chosen it specifically because many small companies don’t have real disaster recovery abilities or real backups because they are deemed too expensive based upon the size of the overall IT budget. In this example, the customer was able to utilize an AWS storage gateway and Veeam backup software to create a workable disaster recovery and backup plan using Amazon Web Services S3 storage and during a disaster EC2 compute. This example does take human work to get the system up and running in a disaster but is much better than the original solution of backups written onsite to the same storage array as production with no ability to recover if the storage or facility was lost. So as you can see, for minimal investment, this customer was able to have a workable disaster recovery plan, because of the cloud and the ability to not have a full time disaster recovery site. For those who are saying yes, but that is such a small environment, I will provide another cost example for a larger customer. This one is more involved so I will not go into all the details, but just list out what was used and the real costs. In summary, it has been my experience that a good place to look at cloud in terms of financial benefit and increased resilience using the ability of the cloud is often DR, backup and archive. If you would like to know more specifics, as with everything in IT, mileage will vary depending on the specifics of the actual data and software involved, feel free to Evolving Solutions to discuss any of these use cases in greater detail. Industry analyst and author Joe McKendrick breaks down a recent survey of 1,000 plus technology managers on their company’s cloud adoption and use. Mr. McKendrick comments on ZDNet, “Not too long ago, cloud computing lurked in the shadows, seen as a workaround to bottlenecky IT departments. Lately, however, that perception seems to have turned around almost entirely. Organizations are almost pleading with IT managers to help them navigate the new cloud world.” With cloud adoption hitting a high the survey found that more businesses are moving to central IT management to plan for cloud use across the organization and 44% of the respondents up from 31% in 2015 acknowledge the role of central IT to set cloud policies. As far as challenges, the survey found that one major concern of enterprise leaders (it even topped security in this year’s study) is having enough resources and knowledge on-hand to manage or carry out their cloud strategies. Leaders are also worried about budget but the article points to new tools and methodologies, such as DevOps, as possible answers to help them meet demand. Overall the survey found that it is a hybrid cloud world out there, where organizations are looking for the “right” cloud to meet their needs.